The phenomenally successful TV series Game of Thrones is nearing its conclusion with the deadly threat of the White Walkers; creatures who dwell north of the Wall of Westeros. Winter is coming in a new collection of stamps honouring Britain's contribution to Game of Thrones. The Royal Mail has unveiled a set of 15 first-class stamps featuring characters from the fantasy TV show, which will go on sale later this month. The stamp set celebrates British contributions to the hit US fantasy series, Royal Mail says. The HBO series, based on the books by George RR Martin, is filmed principally in Northern Ireland and has a mainly British and Irish cast. 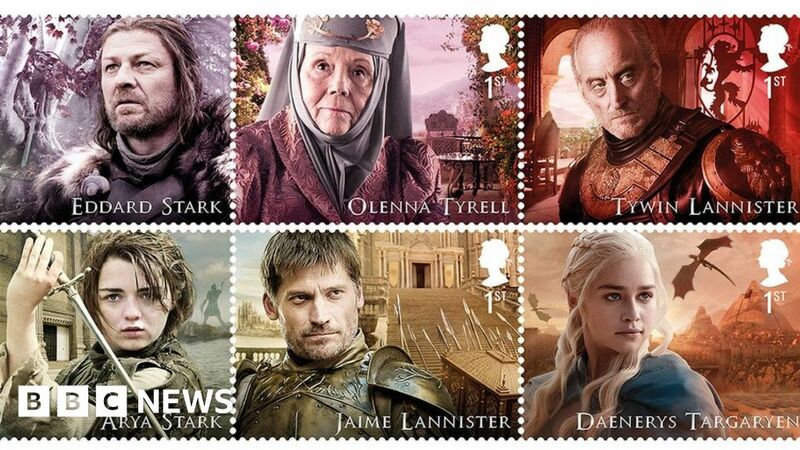 The stamps include the "Mother of Dragons" Daenerys Targaryen, played by Emilia Clarke, Jon Snow (Kit Harington), Arya Stark (Maisie Williams) and Cersei Lannister (Lena Headey). Other characters to feature are Sansa Stark (Sophie Turner), Tywin Lannister (Charles Dance), Eddard Stark (Sean Bean), Olenna Tyrell (Dame Diana Rigg), Tyrion Lannister (Peter Dinklage), and Jaime Lannister (Nikolaj Coster-Waldau). Five stamps include images of the Night King and the White Walkers, giants, direwolves and dragons, and of course the famous Iron Throne. The collection's release comes ahead of the eighth and final series of Game of Thrones, which is currently in production. Most of the filming on the previous seven series has taken place at Titanic Studios in Belfast, Linen Mill Studios in Banbridge and on location across Northern Ireland, while some scenes were shot in Scotland. It is ironic that the latest Game of Thrones series starts with the ominous warning that “Winter is Coming”. The children of Westeros are raised hearing stories of "the Long Night," when man first encountered the White Walkers, an ancient race of ice creatures looking to devour all things good and cover the lands in ice and snow. The Wall of Westeros was designed to keep out all these baddy, zombie like creatures. 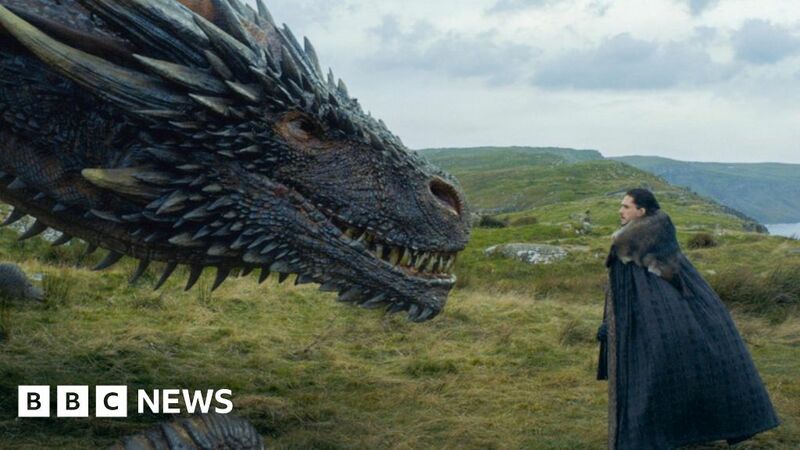 A parallel can be drawn this winter, with the HBO (Home Box Office - American premium cable and satellite television network) hack that saw spoilers for Game of Thrones and complete unseen episodes of other shows released in a massive data breach. A wall of cyber security could not keep these baddies. Hackers claimed to have stolen 1.5 terabytes of data and are threatening to leak even more content, it emerged, after the group illegally broke into HBO's computer networks. The hackers have apparently already leaked what appears to be the personal data of at least one senior HBO executive, including details of her finance and health plan. Leaked stolen information also provided a link to the script for the fourth Game of Thrones episode, with the hackers promising that there was much more to come. Entertainment firm HBO is facing another cyber breach, as it social media accounts are compromised. Whether you’re the Lord Commander of the Night’s Watch, the Chief Information Security Officer (CISO) for your company or the head of your household, it’s your job to prepare your organisation or home to defend itself against thieves, hackers and threats to your security. You’ll need to invest in the necessary equipment and services to combat theft, arson and vandalism in all its forms. 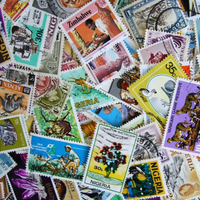 An important aspect of high security for anyone is secure postal arrangements. Is the receipt of your mail secure and safe? Can you improve this protection and ensure your family and stakeholders are safeguarded? At Postbox Shop we can solve all your postal security dilemmas. Secured by Design Letterboxes (high security), Multiple Letterboxes (commercial buildings and apartment blocks), Secure Parcel boxes, Freestanding letterboxes, Surface mounted mailboxes, Recessed postboxes, Through the wall postboxes, Rear access post boxes, Mail chutes, Anti-Arson letterboxes, Fire rated post boxes, Postboxes for gates and railings and Bespoke boxes. You can be assured that you only receive products of the finest quality. Most of our products comply to BS EN:13724 AND Secured By Design New Homes Guide 2014. PostBoxShop can cater to all styles and tastes whether you require a traditional or modern postbox, we will have the solution. We carry stocks and can normally supply within five working days. Our range of post boxes is constantly changing to meet the publics needs and demands to ensure that PostBoxShop remains the No 1 supplier of post and mail boxes in the UK. Please contact us if you have an idea you would like to create…we can make it happen. Or, if you have any questions about any of our diverse range of products and services, letterbox or parcel box ranges, please contact our friendly team today. We wish all our customers a very Happy New Year!! !